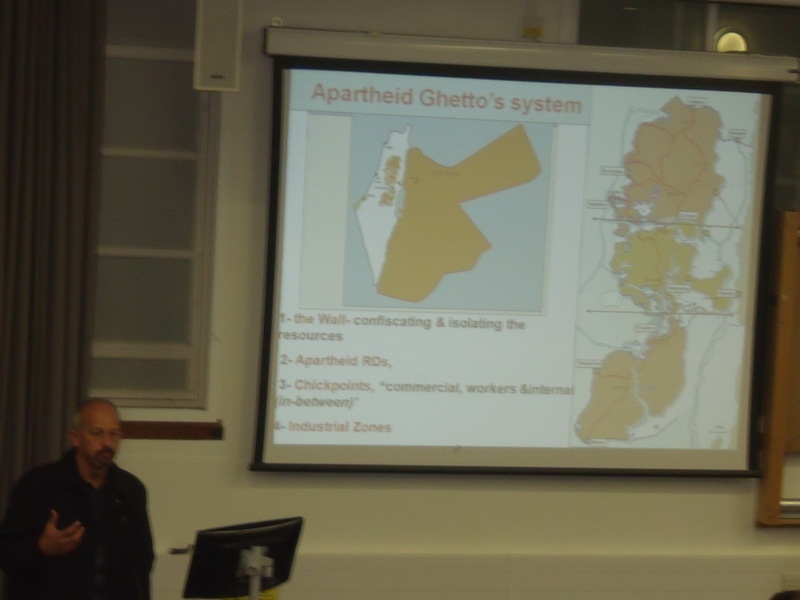 Last night 200 students crammed into Room G2 at SOAS where they heard a new phrase employed in order to accuse Israel; “apartheid ghettos”. 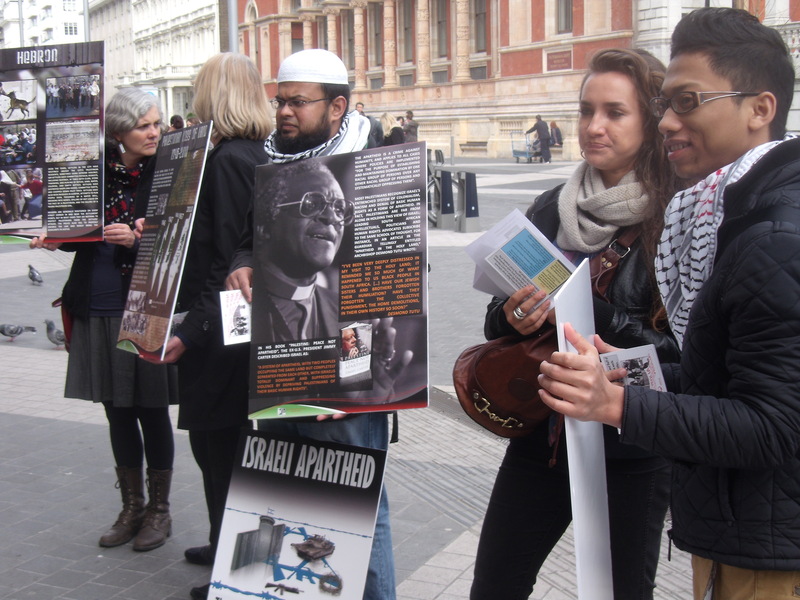 “Apartheid ghettos” neatly combines the horrors of Nazi Germany and apartheid South Africa. 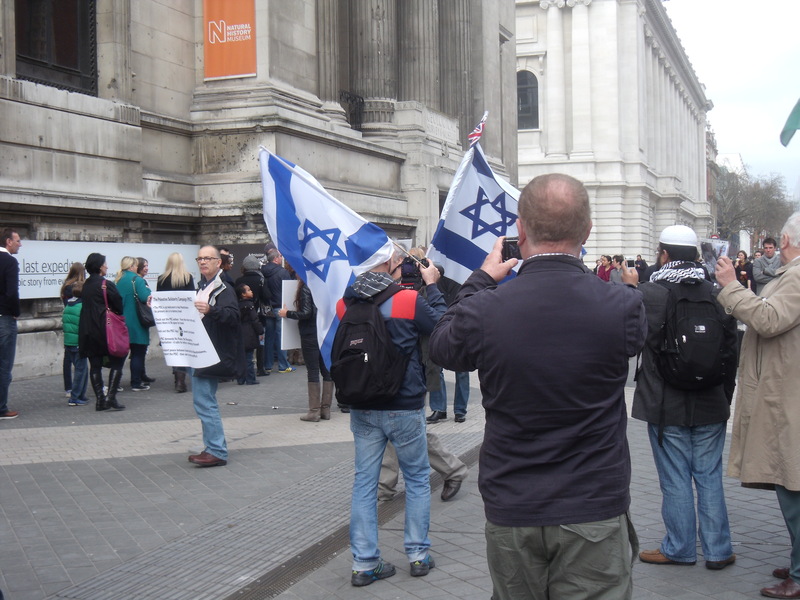 But this time, in sick role reversal, it’s Jews who are the Nazis (see photo above). 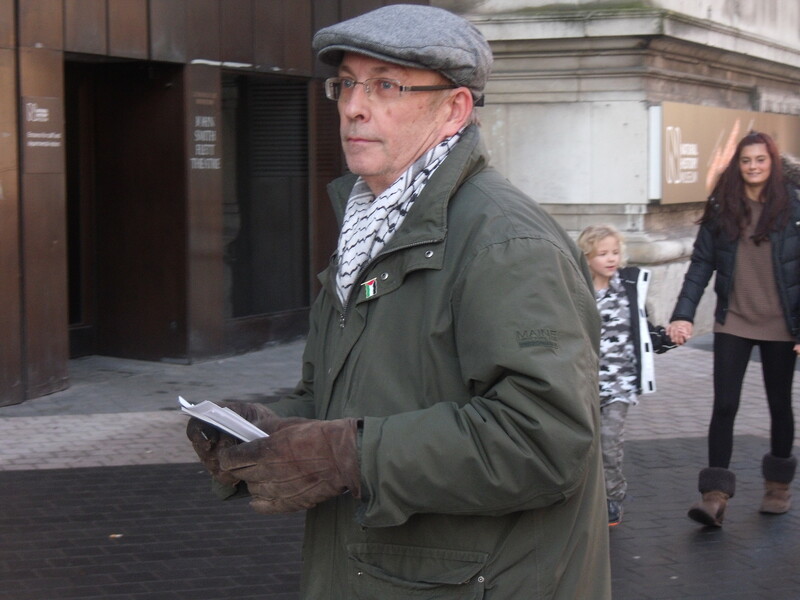 Meanwhile, Daniel Machover, a solicitor, called for “the destruction of the political system in Israel” and for “an end to the Zionist project”. All obvious code for the destruction of Israel, although he wouldn’t admit it. 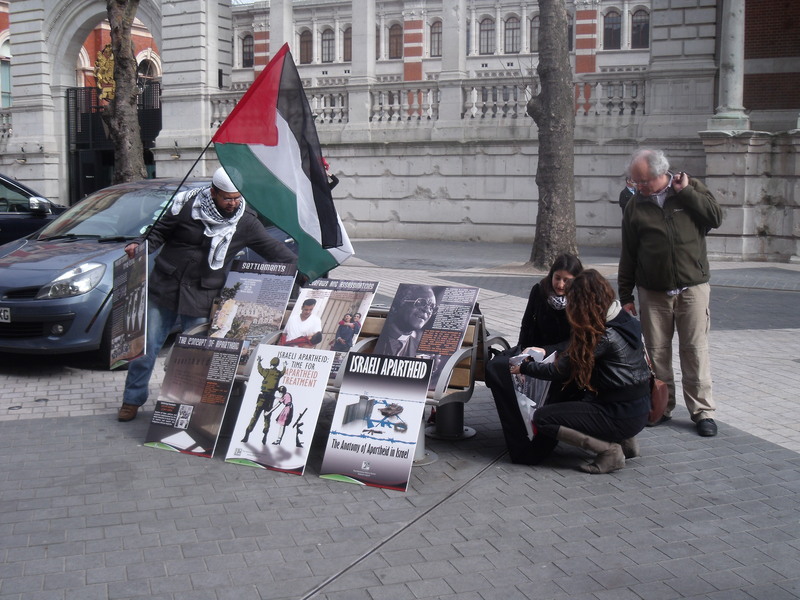 This was all sponsored and organised by British charity War On Want, which, as has been well documented, is funded by Comic Relief. 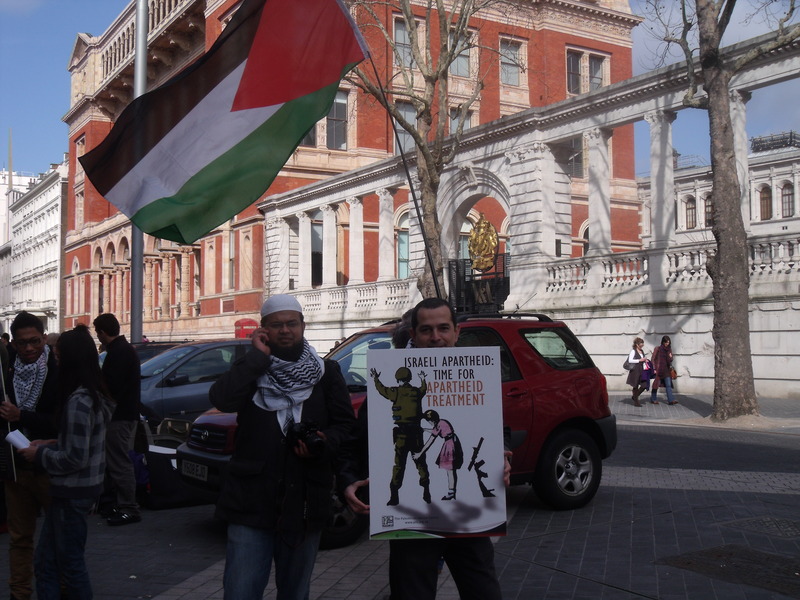 How War On Want can still get away with wasting hard earned Comic Relief donations on hate campaigns where the ultimate objective is the destruction of a country, Israel, is beyond me. 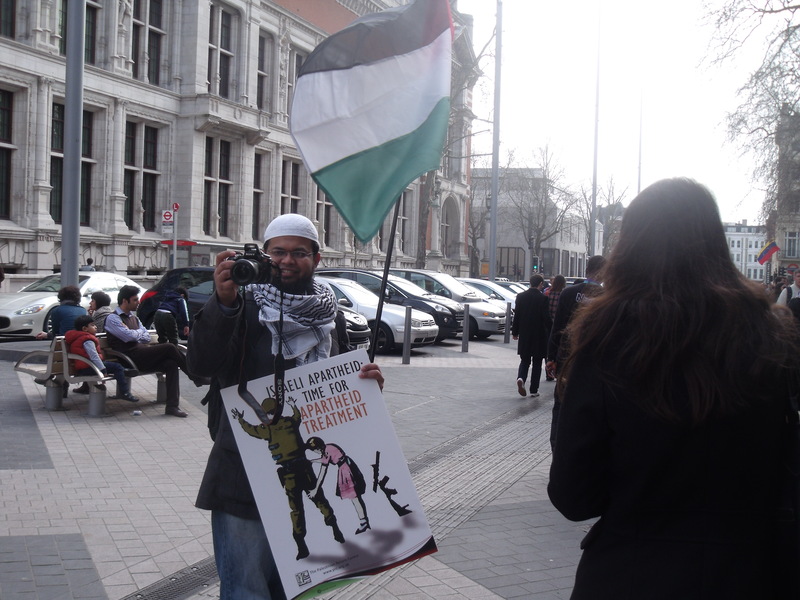 Rafeef Ziadah, a War On Want employee, alleged that Israel boasts that the military equipment it exports is “field tested”, which means it is “tested on the bodies of Palestinians”. 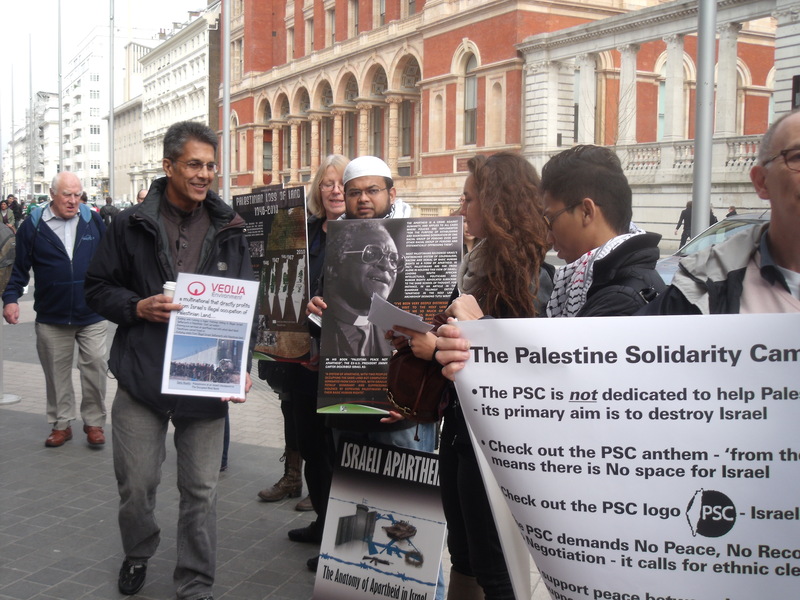 PLAN will be working under the auspices of War On Want concentrating on activism, legal actions and media work. Barat was very excited and went as far as to say that he loves War On Want. 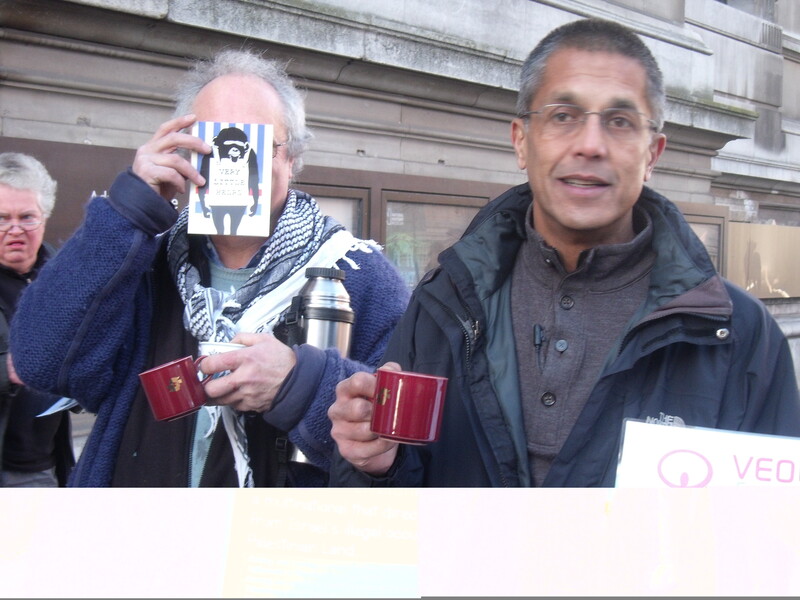 In the chair for this nasty event was Brenna Bhandar, a SOAS law lecturer, who blogged about Fraser v UCU. 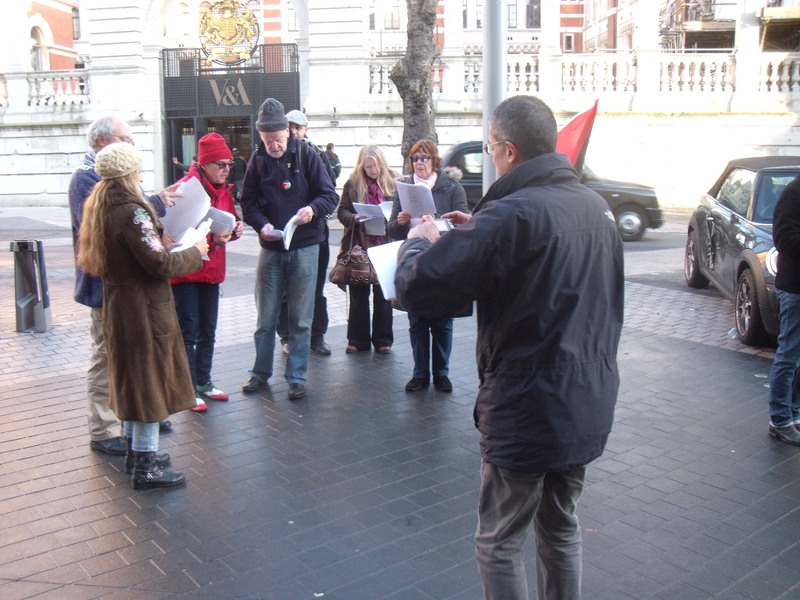 And in the front row overlooking his minions was cult leader himself, John Hilary, executive director of War On Want. 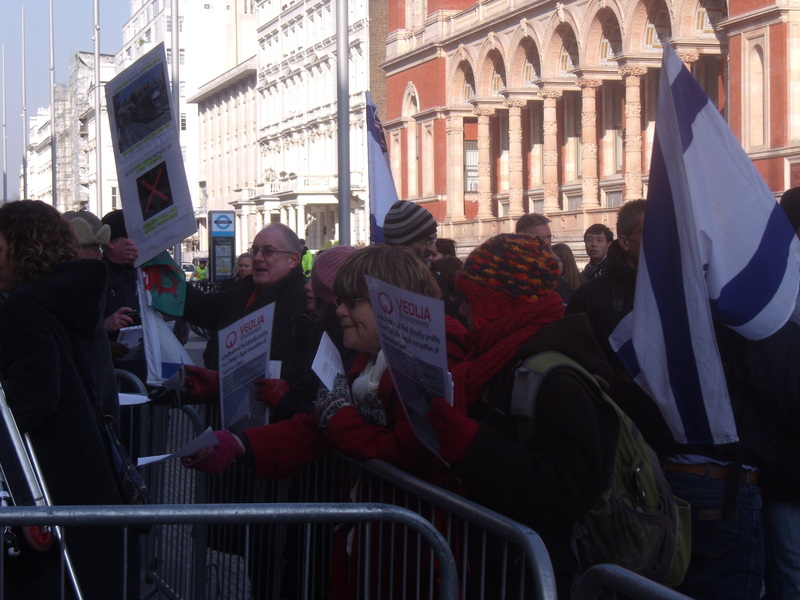 Daniel Machover’s dangerous game of Lawfare against Veolia and Israel. 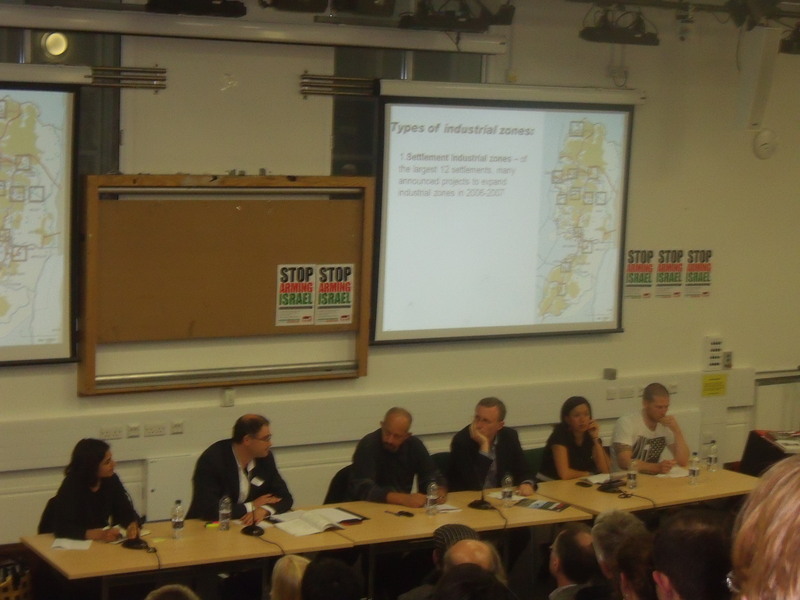 Zena from “Palestine”, Daniel Machover, Yael Kahn listening to an activist at ULU last night. “We don’t want you. 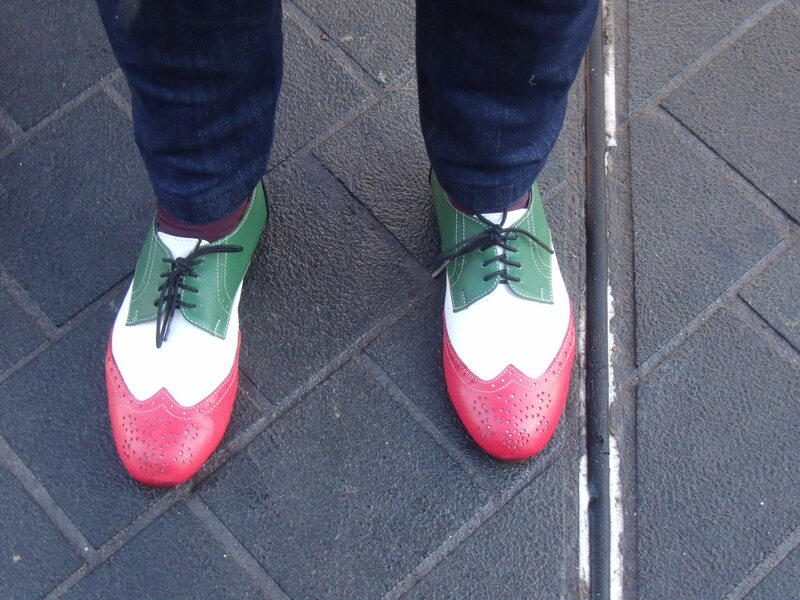 You’ve been undermining people’s meetings. You interfere with people’s freedom of speech. We don’t want you here. Goodbye to you. We don’t want you. You are here for one purpose; to interrupt and to undermine people. I’ve seen you many times. I’ve seen you in action many times. You’re not invited.” Listen here: Yael Kahn asking me to leave. Once I told her that I wasn’t leaving as it was a public meeting and that she should have arranged the meeting in her home she shuffled off to chair the event instead. 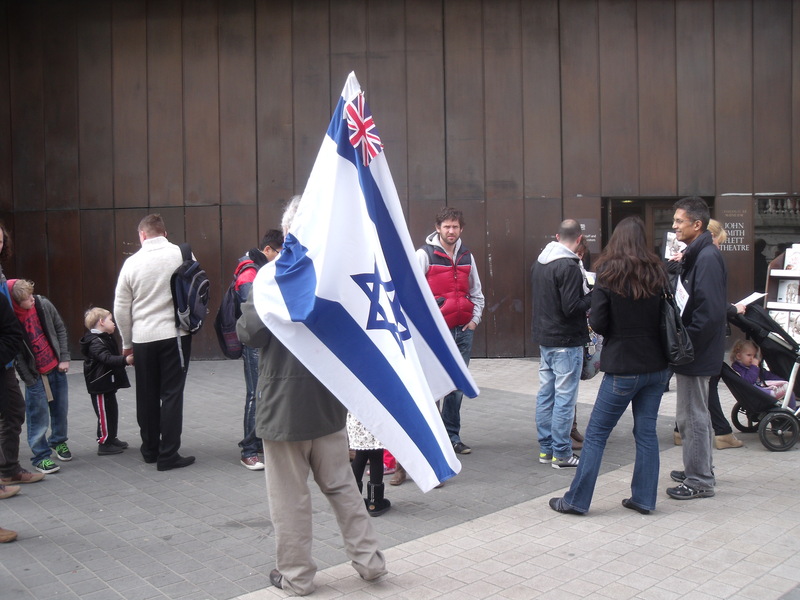 It’s incredible that these Israel haters are supplied with a room paid for by the British taxpayer at a British university and presume they can exclude anyone they don’t like (the advert states the meeting was “sponsored by ULU”). 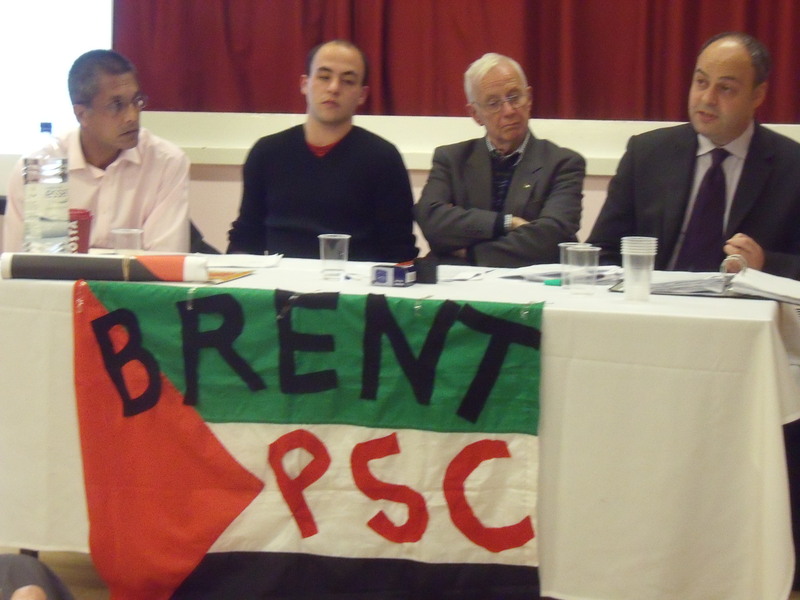 The main speaker was Daniel Machover, described as “Solicitor, the UK expert on Human Rights, Israel and Veolia”. 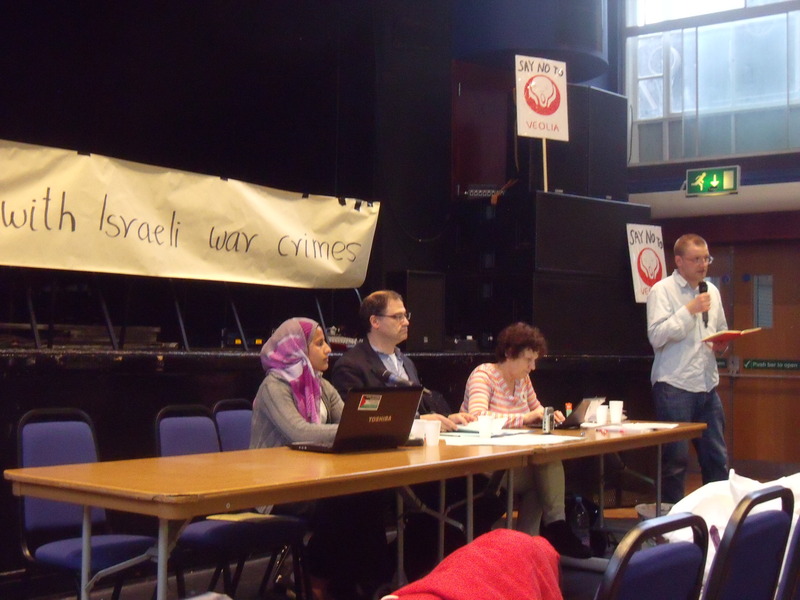 Jeremy Corbyn MP was also supposed to speak but failed to show up. 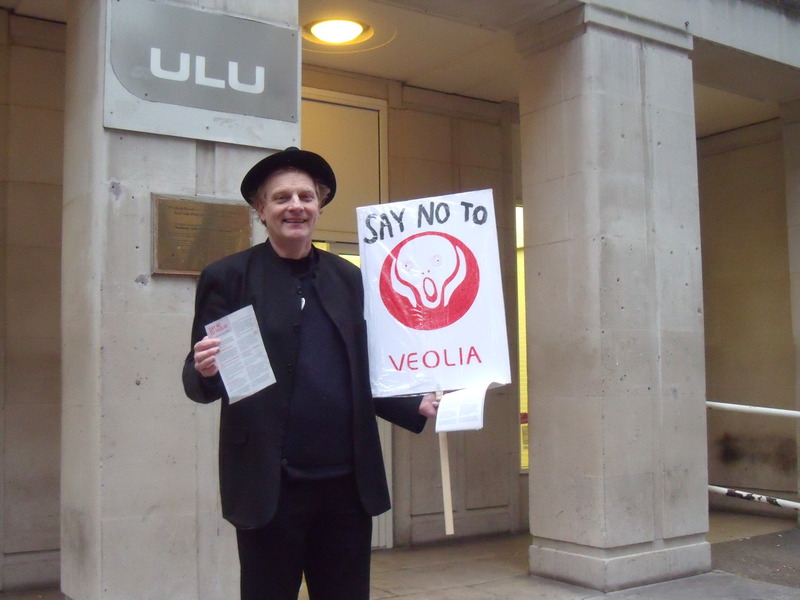 Machover presented his lengthy legal opinion on how to exclude Veolia from the public contracts given out by local authorities. 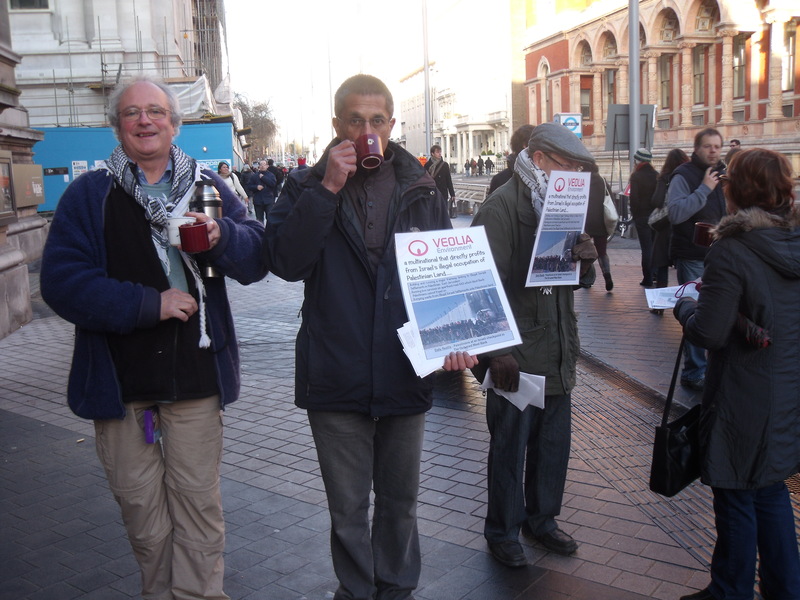 Veolia deals in waste management and construction and has been building the Jerusalem Light Railway, which, Machover says, is in breach of the Geneva Convention and UN resolutions because it serves “illegal Israeli settlements”. 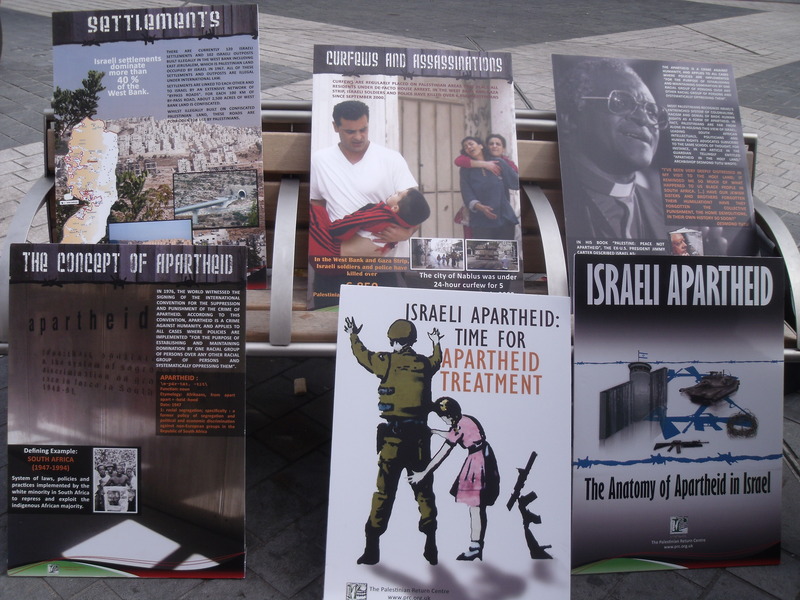 The main UN resolution Machover relied on was that passed by the UN Human Rights Council in April 2011 and called The grave human rights violations by Israel in the Occupied Palestinian Territory, including East Jerusalem (see clip 1 below). 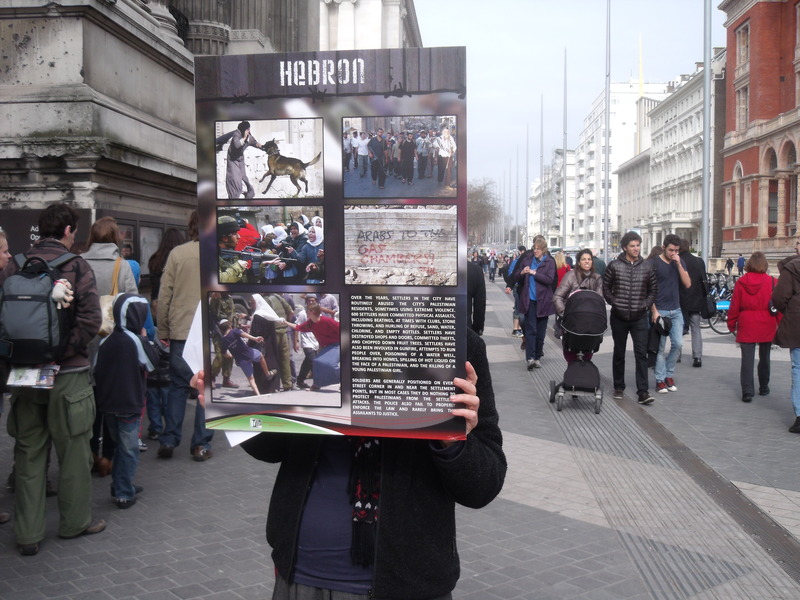 At that time countries on the UNHRC included Libya, Bahrain, Ukraine, Jordan, Russia, Saudi Arabia, Malaysia and Qatar. All have brutal human rights records so for Machover to cite such a resolution proves the weakness of his case. Machover also seems to be adopting the similar failed tactic of Michael Mansfield QC. 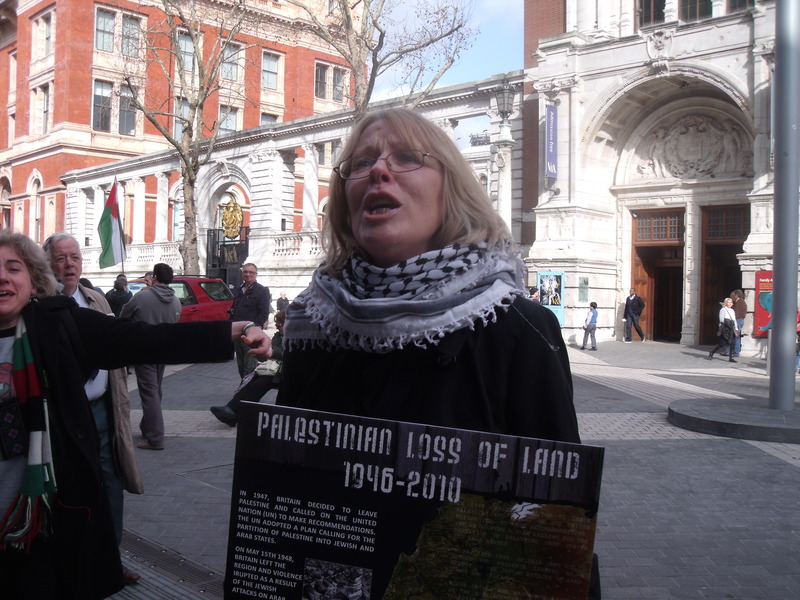 At an event at Amnesty International in November 2010 Mansfield gave a legal opinion on the defence anti-Israel activists could employ if they entered the shops or offices of companies doing business in the “illegal Israeli settlements” and were arrested. 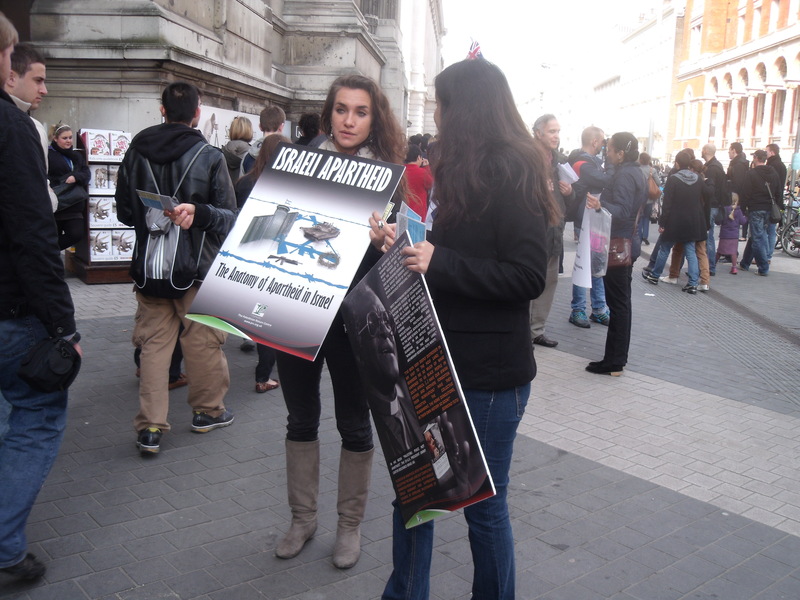 With such advice in mind anti-Israel activists Matthew Richardson, Gwendolen Wilkinson, Jessica Nero and Christopher Osmond entered the Ahava shop in Covent Garden and succeeded in shutting it down for a few hours while making their protest but they were subsequently landed with criminal convictions for aggravated trespass. Happily though for Mr Mansfield his chambers picked up the business as the four defendants were represented by barristers from Tooks. 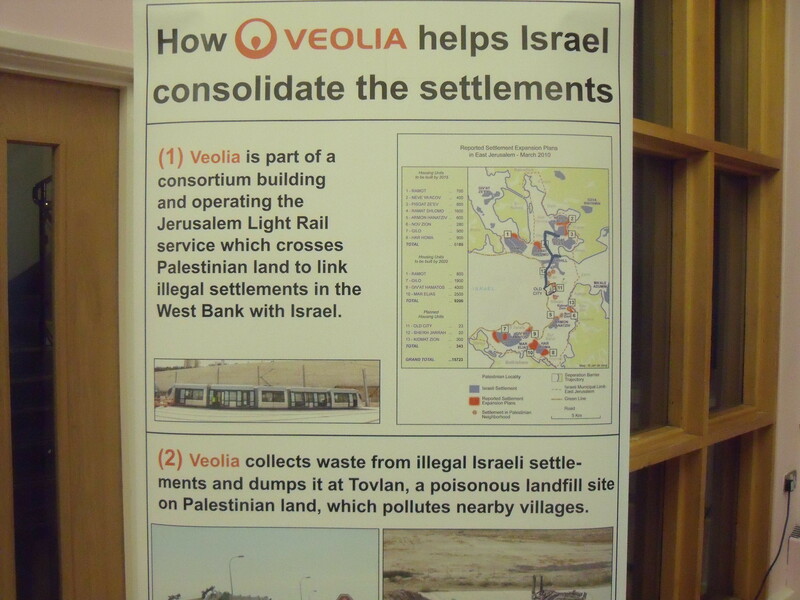 Similarly, Machover seems to be pushing local councillors to exclude Veolia from local authority business but for all his lengthy quoting of local council law to support his view he still has to overcome the same hurdle that the four convicted anti-Ahava activists failed to do; the legality of “the settlements”. Apart from the fact that the American government doesn’t “say so” how would Machover explain the decision of the judge in the Ahava case outlined above that Ahava, with its factory on the West Bank, was “trading lawfully”? 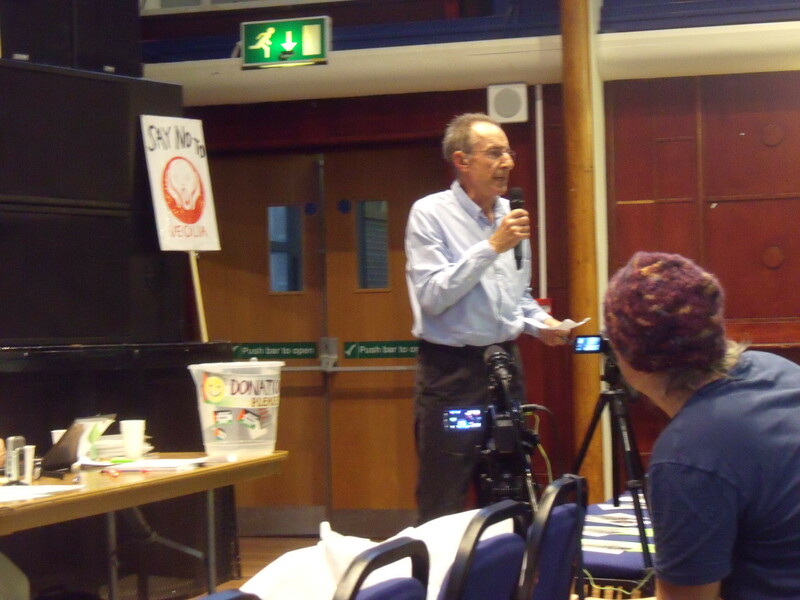 Machover’s advice could have extreme financial consequences for local councillors who incorrectly exclude Veolia from a public contract, as Machover himself acknowledged. The local councillors could leave themselves open to being personally surcharged millions of pounds for any loss to Veolia like Dame Shirley Porter was in the 1990s “homes for votes” scandal. 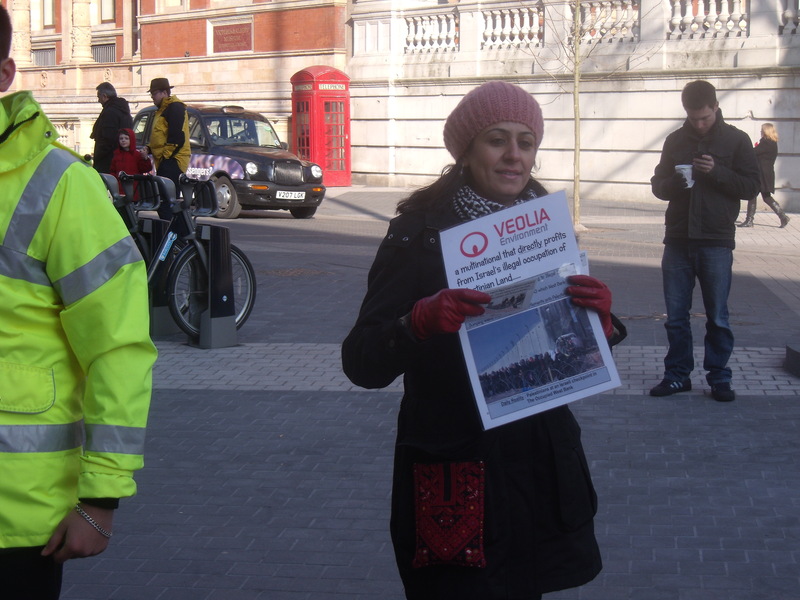 Yael Khan then tried soothing everyone’s nerves by claiming that there had been, apparently, no challenge by Veolia after it lost a £1bn contract in South London, although I doubt that loss had anything whatsoever to do with her and her colleagues. 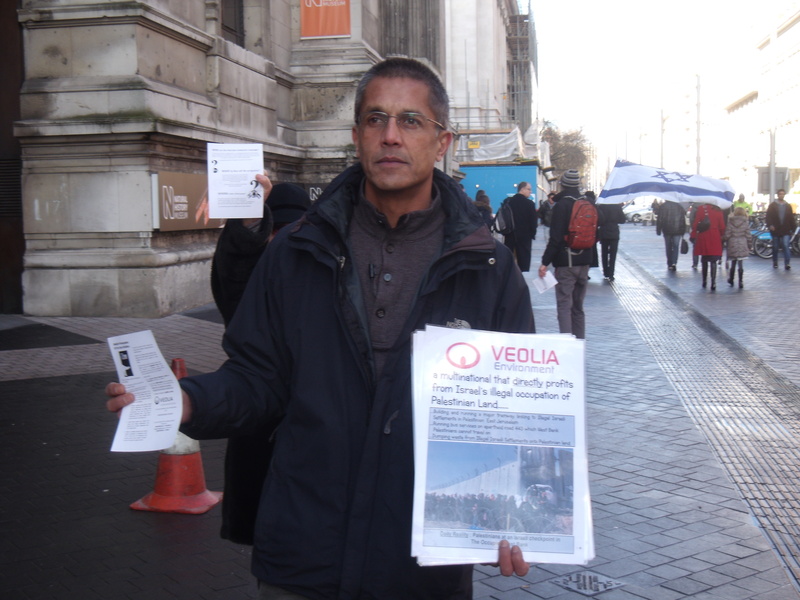 It’s possible that Veolia, itself, would not have to sue. A concerned resident could possibly have locus standi to instigate proceedings to have councillors surcharged. 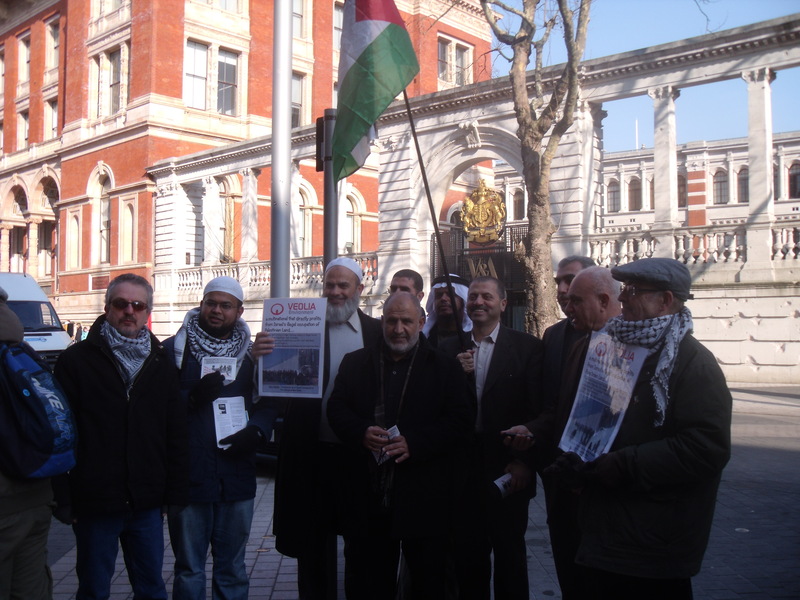 Just like other Palestinians who have come over here and made the same claim they all look very well to me. Maybe they’re just the lucky ones…. The welcoming party on the door at University of London Union last night. 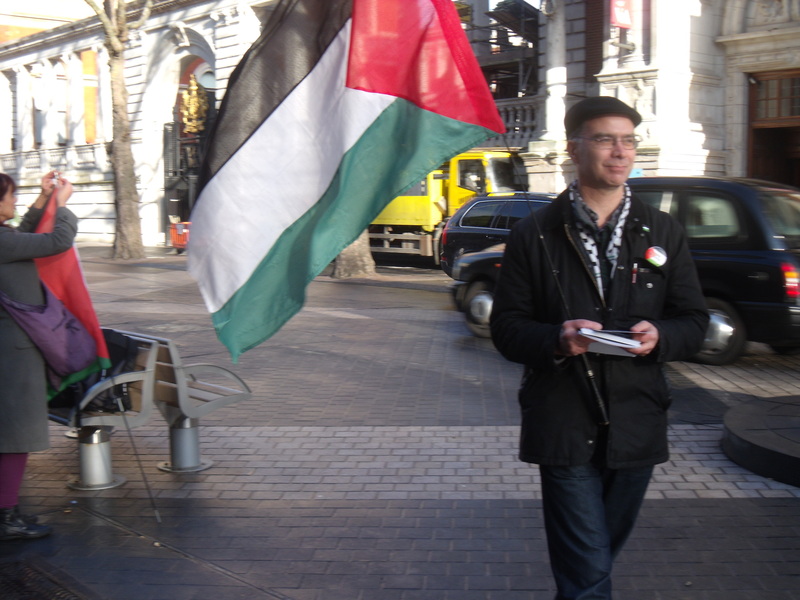 A Canterbury activist from anti-Israel Conservative MP Julian Brazier’s constituency. 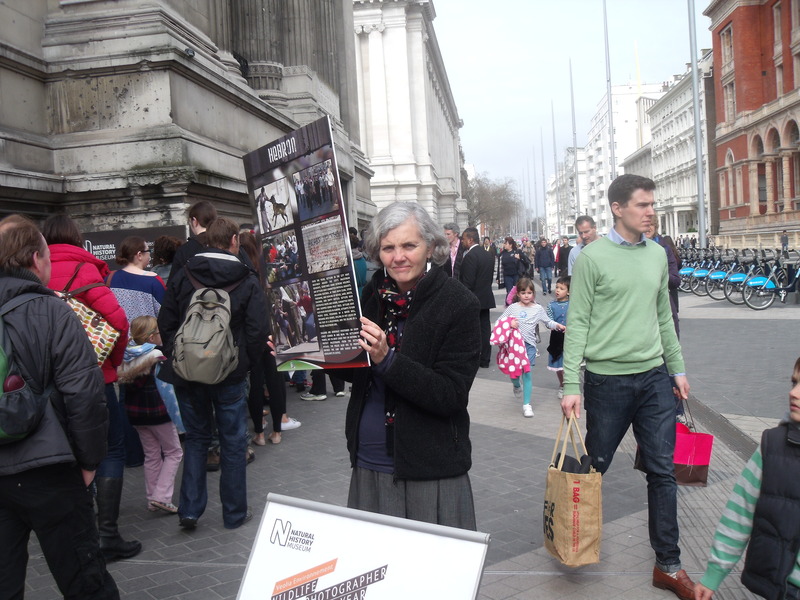 Outside the Natural History Museum today. 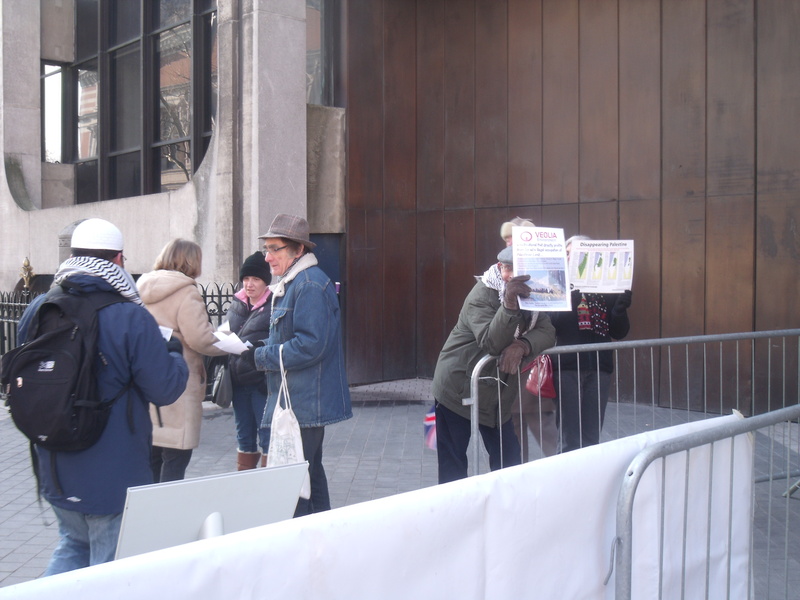 Anti-Israel activists in London didn’t seem to have a care in the world today about Bashar Assad’s continued slaughter of his own people in the cities of Homs, Aleppo and Damascus. 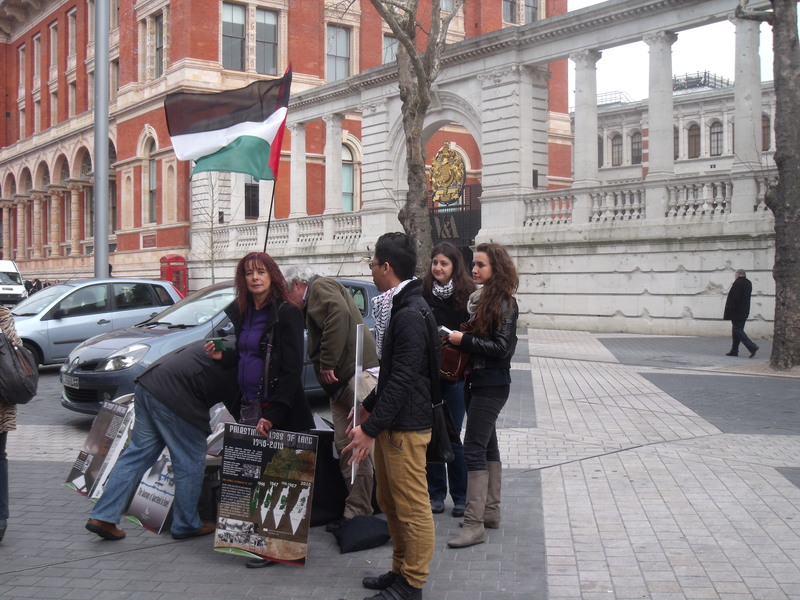 Instead, they urged people queuing for the Natural History Museum to boycott an exhibition sponsored by Veolia because it does business with Israel. 1. 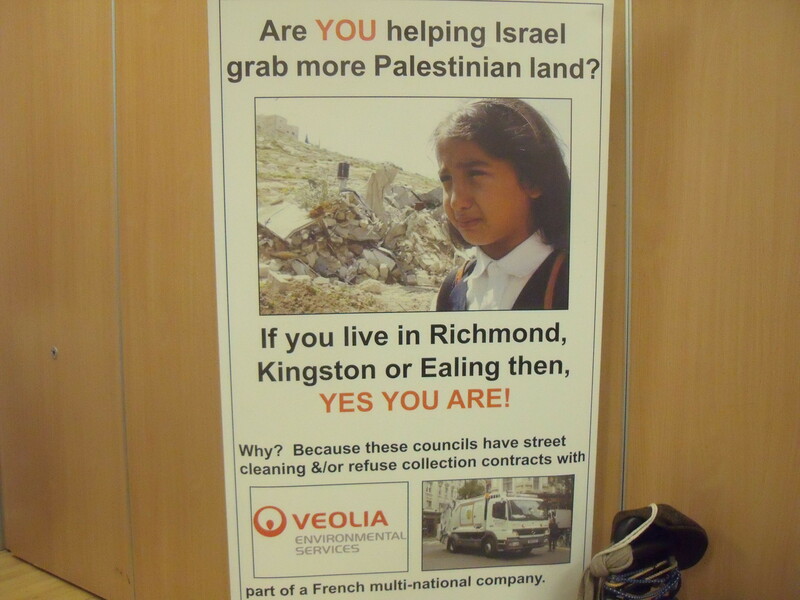 Veolia placed job adverts for the Jerusalem Light Railway which were racist being “deliberately designed to stop Palestinian citizens of Israel from applying”. 2. 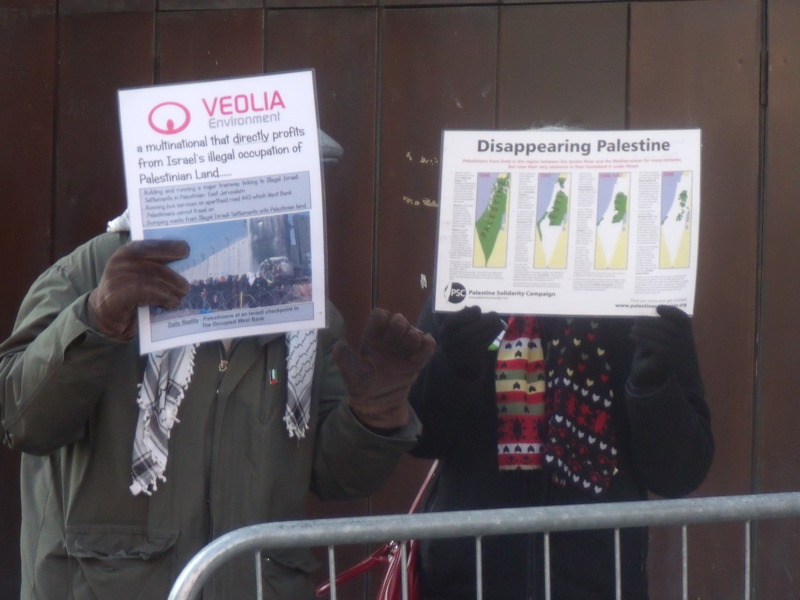 Veolia operates buses to “illegal” Israeli settlements on the West Bank and that “Palestinians are often stopped from using the buses that Veolia runs”. 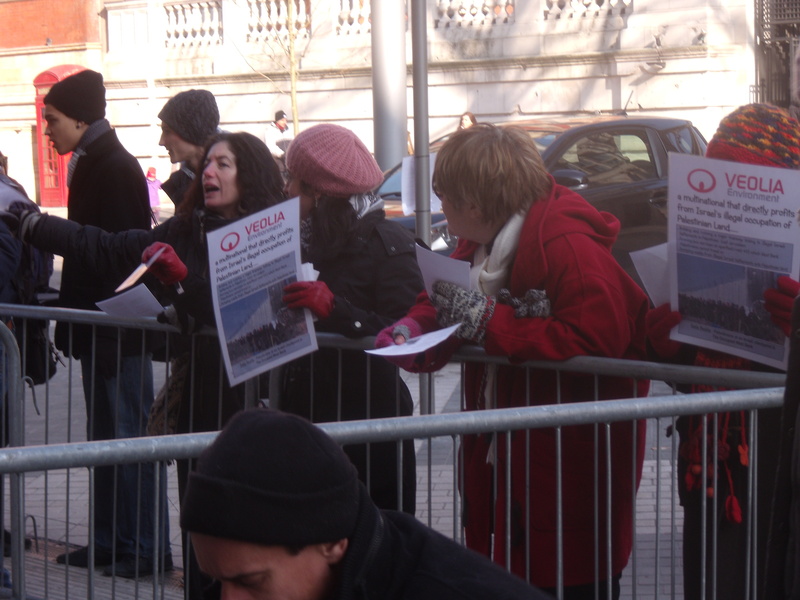 The leaflet concludes by asking you to tell the Natural History Museum that you disagree with Veolia being the sponsor of the Exhibition and to “ask the museum to drop Veolia”. 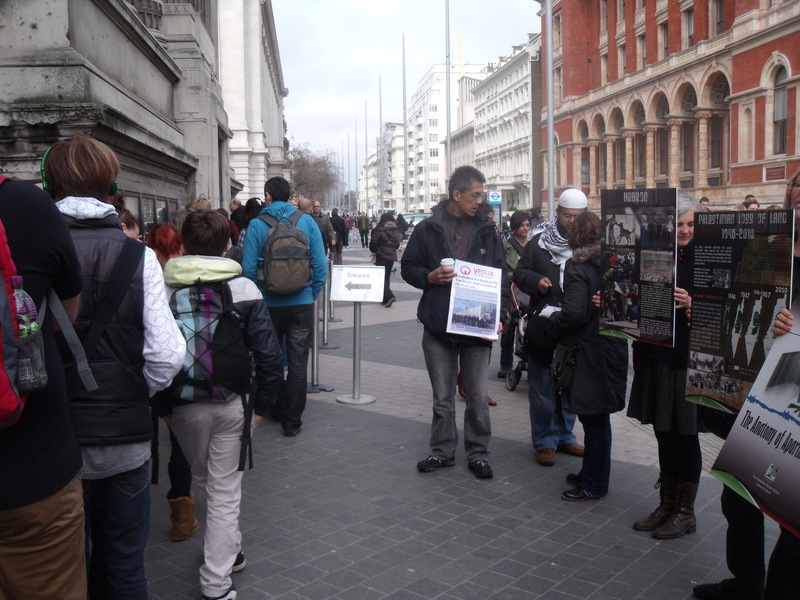 Well, luckily, the Natural History Museum hasn’t capitulated to the lies and the Veolia Environment Wildlife Photographer of the Year exhibition is set to run until 11th March 2012. 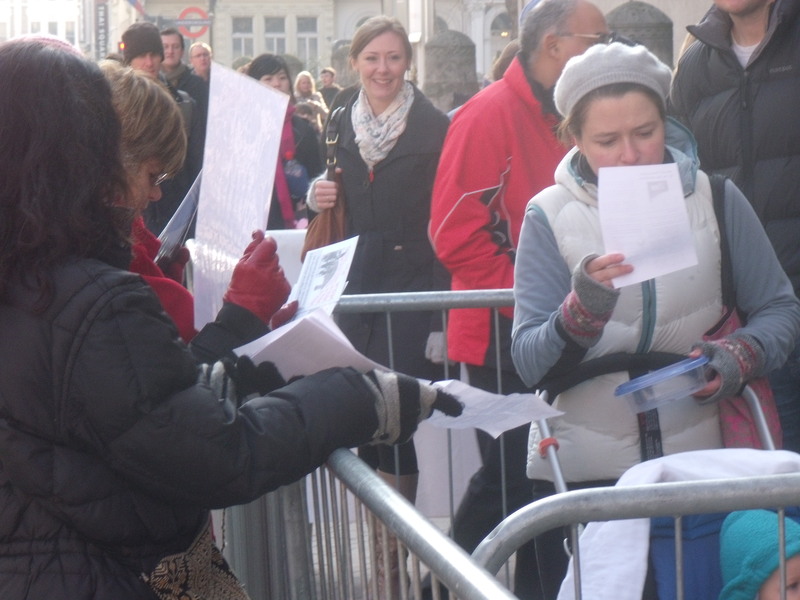 Judging by the long queues it’s a must-see. 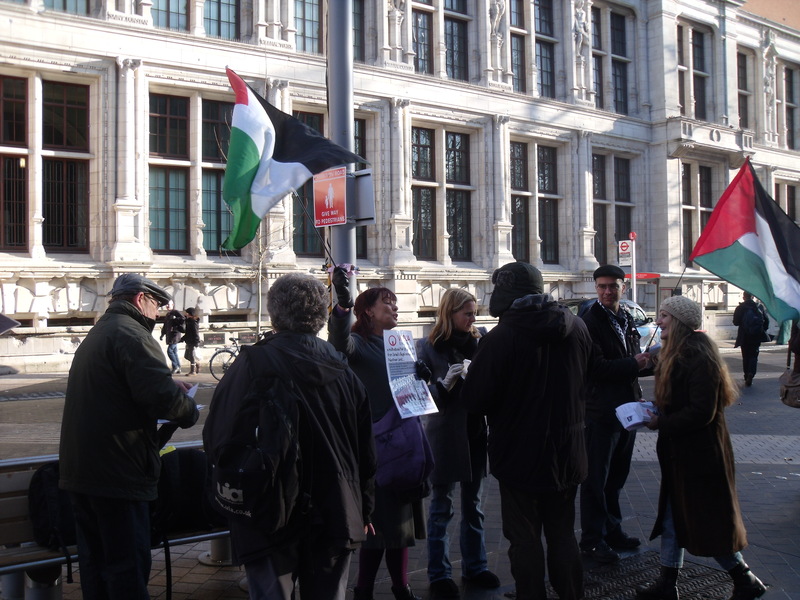 Although there were some 20 anti-Israel activists there were about 10 pro-Israel counter-demonstrators to give some balance to the proceedings, including Phillip who brilliantly drove down from Wales to add his support. 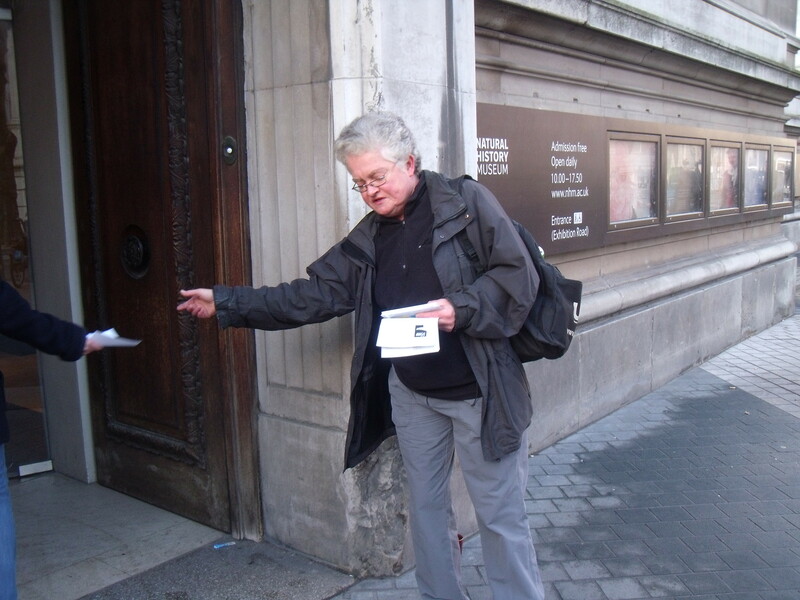 Handing out lies to museum goers. 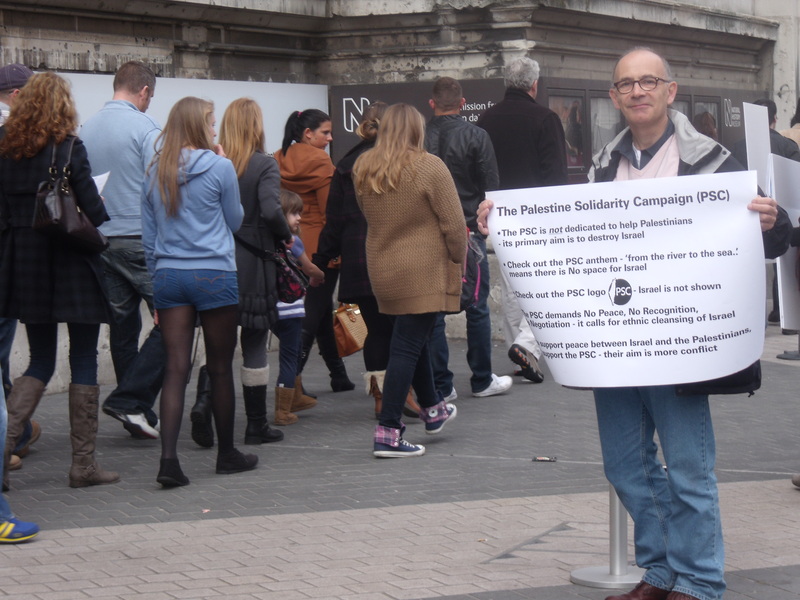 Phillip from Wales, placard in hand, shows his support for Israel. 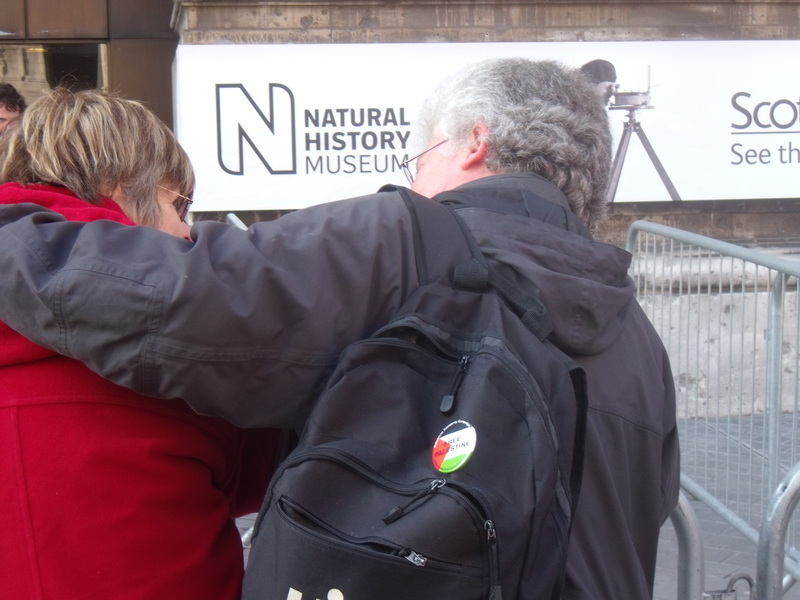 Two Israel-haters show their love for each other.